Exacerbation of COPD refers to a clinical condition featuring suddenly worsened chronic obstructive pulmonary symptoms. COPD is a group of disorders manifesting with some common symptoms like shortness of breath, chest tightness and productive cough. When these symptoms become severe suddenly, the medical condition is termed as COPD exacerbation. Several factors give rise to exaggeration of chronic obstructive pulmonary diseases. Major causes complicating COPDs are respiratory infections due to bacterial and viral spreads, air pollution and pulmonary embolism and idiopathic initiation. In one third of these cases, the triggering factors are absent or cannot be justified. Some patients are prone to allergies to certain molecules and feature anaphylactic reaction which is presented as exacerbation of COPD as well. Some patients have presented with worsened cases of COPD; after investigations failure of drug therapy turned out to be the triggering factors in these cases. These all are common issues that can give rise to life threatening lung incompatibilities. There are many other indefinable factors too; but they can’t be associated with any symptom and hence not included into major causes. Exacerbation of chronic obstructive pulmonary disease can be partially prevented. The principles of prevention refer to reducing or debilitating the triggering factors. Early diagnosis and treatment of respiratory infections and pulmonary embolism are effective strategies to prevent worsening of COPD symptoms. Simultaneously, the patient must take counseling from the professionals about the other factors present in the environment and how they can manifest into acute exacerbation symptoms. The patients should be well-informed about the consequences of drug therapy-failure cases. They should know about their allergic traits, genetic anomalies and the molecules that may act as allergens to their immune systems. Exposure to polluted air is one of the major reasons of complicated COPDs in developing countries. Hence, ensuring a pure air-environment should also be taken under consideration. Steroids therapy: Glucocorticosteroids are given to the patient in oral, Intravenous or inhaled form. Steroids are considered as life savers in cases of inflammation. Pulmonary problems respond almost instantly to steroidal therapies. Antibiotics: If the underlying cause of exacerbation is associated with bacterial or viral infections, antibiotics must be prescribed immediately. Bronchodilators: Bronchodilators help in breathing mechanisms. The patient is relieved and chances of shock followed by coma reduce significantly. Others: Beside the major therapeutic measures, some experts provide with some supportive treatments. They often prescribe respiratory stimulants, ICU ventilator support, and palliative care after immediate hospitalization etc. Care given at home: The family members should be well aware about the situation. They must know how to keep the symptoms under control and support the patient in all possible ways. At home, proper hygiene, sanitation, air cleaning should be practiced for supporting the medical treatments. The patient should be kept away from any kind of air pollution, smoke or allergens. The drugs should be given in due time. Balanced diet chart (may be a separate diet chart) should be maintained. The family members should help the patient take enough rest, do regular physical exercises and sleep adequately at night. Management of COPD exacerbation at hospital: In acute conditions, the patient is taken to the hospital immediately. A pulmonologist visit and handle the case of acute COPD conditions. They immediately start the treatment protocol. High flow oxygen is given immediately after admission. Gradually other supportive drugs like Steroids, bronchodilators etc. are given. COPD is the third leading cause of death in the US. These disorders are considered as one major cause of death in all the developed and developing countries. About 25 percent of diagnosed COPD cases are seen manifesting into exacerbation. 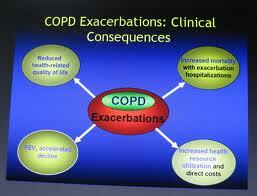 About 15 percent COPD exacerbation cases lead to pulmonary failure and death. More than 30 percent of COPD exacerbation cases don’t associate any detectable cause. These cases are considered as idiopathic. Global Initiative for Obstructive Lung Disease i.e. GOLD has been working on COPD exacerbation cases around the world. They have trained the medical professionals, millions of COPD patients about the sudden life threatening emergency medical condition. Lung functions are debilitated significantly in COPD exacerbation cases. Taking essential preventive measures, maintaining an optimal and healthy environment can protect the COPD patients from such lethal conditions.